I originally had no intention of doing a pumpkin cupcake this year. I have so many ideas for fall, with the skull cakes and the apple cider cupcakes and I thought pumpkin was just too predictable. I was talking to my friend Greta, about a beer and pumpkin cupcake she was creating and it got me in the mood. The result was great. I'm sure the ladies at my daughter's preschool will be happy to know these are going to them tomorrow morning. I plan to make them again for Thanksgiving, however I will be making them gluten free for that event. They weren't overly sweet, which is just how I like my cupcake and frankly the cupcake itself could easily be converted in to a pumpkin bread. 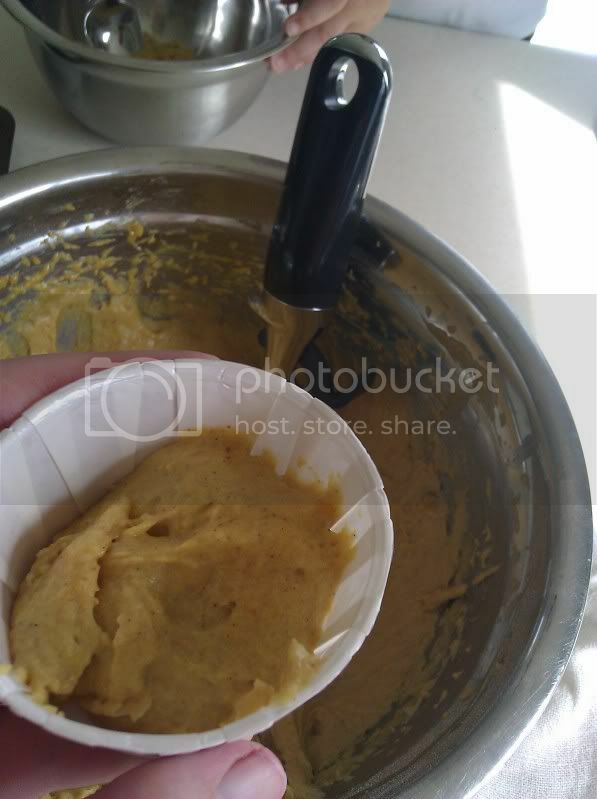 In a large bowl whisk together spices, flour baking soda, baking powder, and salt. Add both sugars slowly ad whisk so there are no lumps. In a separate bowl beat eggs with an electric mixer until yokes and whites are combined. Add pumpkin puree and mix. Add melted butter and mix again. Slowly add dry ingredients and mix until well combined. Fill cupcake papers 3/4 full and bake for 25 minutes. 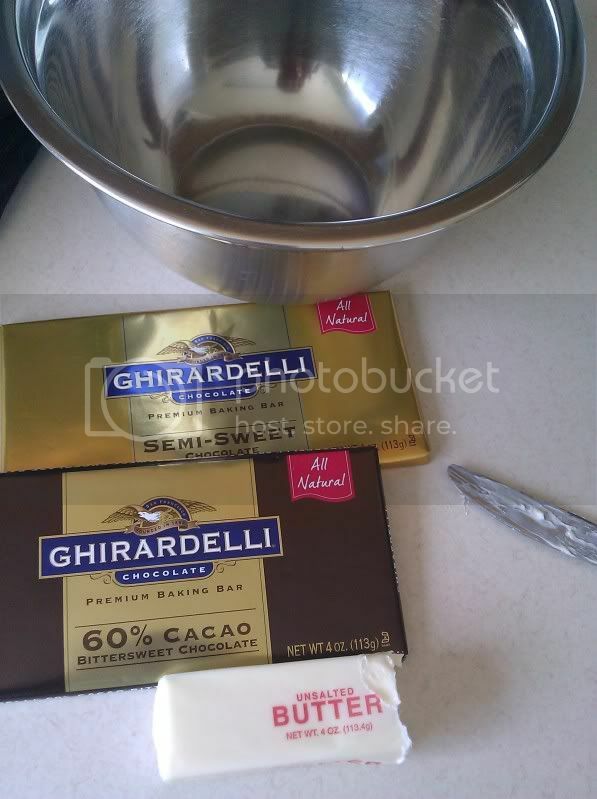 Using a double boiler (or a pot of boiling water with a metal bowl on top) Melt chocolate with half the butter. Remove from heat, add remaining butter and add vanilla. 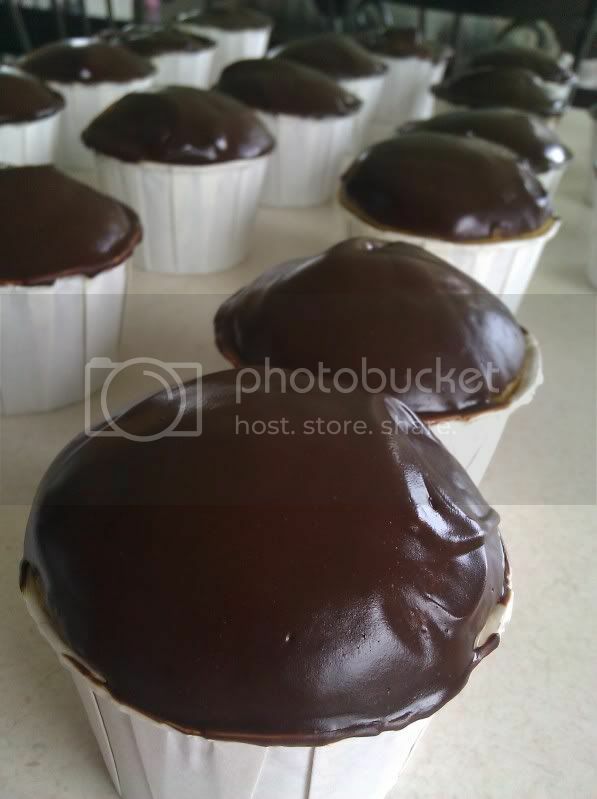 While ganache is hot dip each cupcake in to the ganache and set aside to cool. The ganache will get firm and glossy as it cools it's a great presentation. 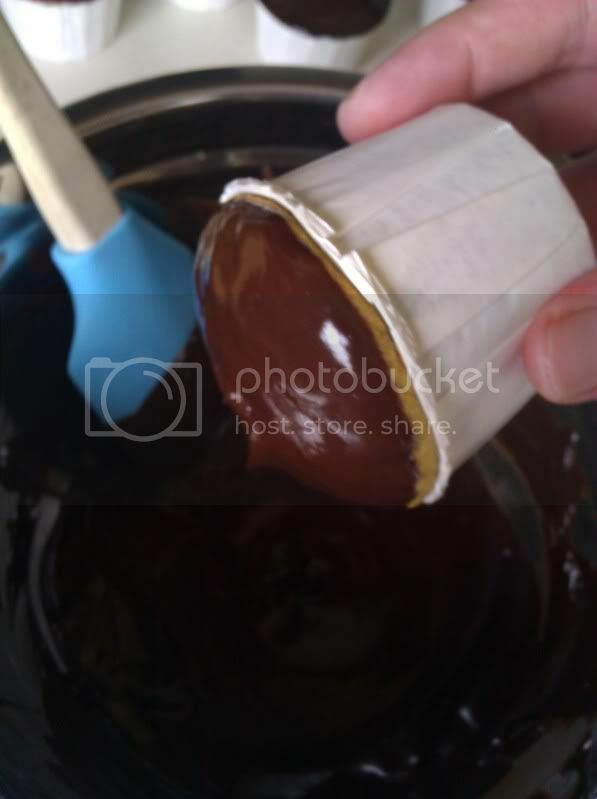 Don't be afraid of ganache if you haven't worked with it before, it's unbelievably easy. I didn't want a super stiff and sweet frosting for this cupcake, so I wouldn't recommend a fancy piping job. I used a round tip and I got a great presentation. 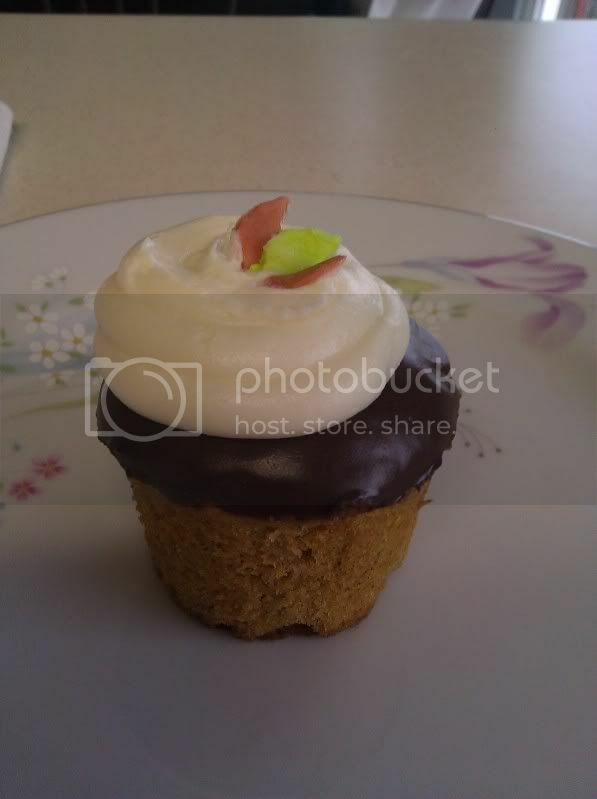 I made little leaves out of marshmallow fondant to top the cupcakes, and I frosted them slightly in from the edge, so you would see the chocolate. They came out great, I can't wait to make them again for Thanksgiving. If you are typically not great at presentation, this is a great cupcake to try, it really is easy to make them look good. awwww I think I want this recipe instead looks easier and no alcohol. I am just gonna use the cream cheese part lol kidding. Anywho I am loving your blog!! YOu are so talented. I was reading your recent post about cupcakes and you really should do for it, you are super talented and If I lived close to you you better belive I would be having you make my dd cupcakes for her party!!! This is misssy2000 btw! You go girl!!! Love your story! Missy, the recipe I gave you was for a stiff frosting. As I said before you sub milk for the alcohol. You can use this frosting if you would like, it will go with just about any flavor, but it is not a stiff piping frosting like you asked for. Thank you Wendy. I use organic vanilla or actual beans myself. The cupcakes look yummy and the recipe looks easy enough. Will try them soon. Once more congratulations and wishing you all the best with your cupcakes. love love love love this thanks sooooo much !!!!!!! u are my hero lol keep up the great work!!!! I read a story about you at CafeMom the other day about how you found the encouragement to start something new with your cupcakes. I just wanted to tell you congratulations and that your story inspired me to try something new for myself. It's always nice to find inspiration in unforeseen places. So thank you and good luck with all your endeavors. Lovely cupcake. It looks so nice and pretty sure taste goods with all the flavors in it. Thanks for the recipe. These cupcakes look stunning! Thank you for the recipe and the great tips! Wow! Yummy! 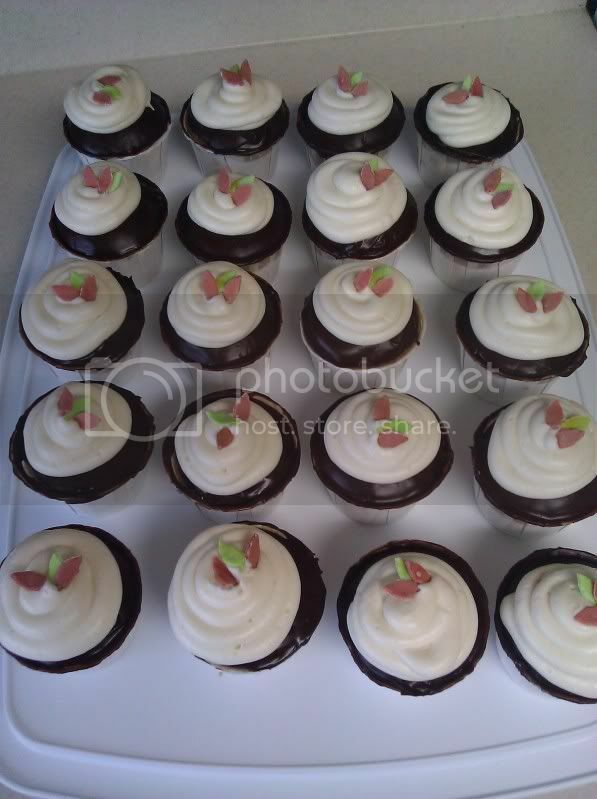 Your Pumpkin Cupcakes With Chocolate Ganache and Cream Cheese is perfect for all occasion particularly birthday party. I will surely bake this during my son’s birthday party next week. Thanks for sharing the recipe! How many cupcakes does this make? Maybe I've overlooked it. .I keep looking and cant find it though. Admirable goods from you, friend . I've be familiar with your stuff previous to as favorably as you are simply extremely brilliant. I in fact appreciate what you have acquired here, undoubtedly like what you're saying furthermore the mode in which you articulate it. You make it fun in addition to you still worry for to keep it prudent. I can't wait to read a lot more from you. This is certainly a marvelous web page. In conclusion , let me thank you for your tolerance with my English as (I'm positive you have become aware this at this time ,), English is not my first language as a result I am using Google Translate to shape out how to note down what I genuinely plan to voice. I have made these wonderful cupcakes many times. I always receive lots of great comments.